Pupil and assistant May 1794 - September 1808. 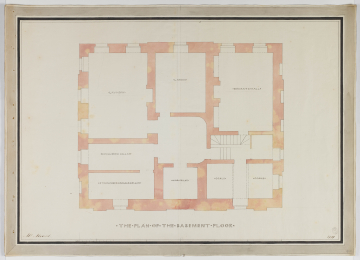 The Soane office Day Book for 26 June 1799 has an entry viz,' Mr Mansell / Drawing Plans of / the Basement Story / of intended Ho / Seward'. The (raised) basement is lit by two windows at the front, five at the back, four to the left and two to the right so that, for example, the laundry has five good-sized windows.